How to repair your RO with ease? The water purifier is a common term that probably everyone has heard these days. The scarcity of pure water made the researchers invent this compact yet useful device which has changed the scenario in no time. 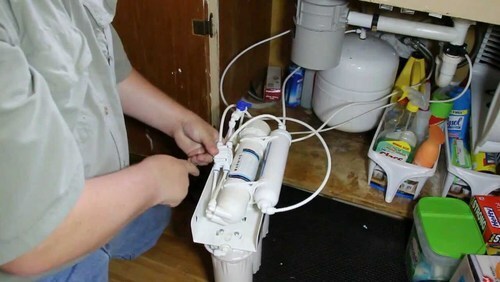 What makes a Reverse Osmosis System run significantly well is to deal with its various troubleshoots and have a clear plan to repair the issue. If you are having an old RO system installed for a long time and one fine morning unlike the other, you have your glass half-filled from the system. The moment you want to fill the glass full, it trickles down, it is a clear sign that the inner pressure from where the water drops down is low or the water volume is low. First of all, the water supply to the system should be stopped. Then, the tank valve of the storage needs to be turned off. Neatly, cut the connection of the tank from the outside for the water to drain out, and the tank becomes empty. Once this is done, check the pressure which should be inside in 6-8psi. Add pressure inside the tank if you find that the level of pressure has gone down. Then, you can fill the tank all over again. But in a subsequent period if you are bothered by the same problem, then the bladder must have gone damaged, and the entire tank needs to be changed. When the valve which has to be shut does not close properly, this issue arises. So what you can do is, see if the valve which is referred to as check valve is not damaged, refill the tank and leave the tank open for the water to drain out. Afterwards, you can turn the water valve off. Find if the water is draining through the drain valve, then it must have been damaged, and you might replace it. And if otherwise, then there is a valve known as ‘shut’ which might be damaged and needs replacement. If your taste palate makes you feel that the water has turned stagnant or depleted filters or fouled membrane is an issue then go for replacing the fouled membrane and then you can flush the entire RO Repair system once or twice. Do not panic if these simple issues line up. You do not even need to pay extra money to the plumber for fixing it. So what you can do is follow these steps for RO Repair system.